Nestled in the grounds of Trewoon are three cottages; Rest-a-Shore, The Chocolate Box (property number 52) and By the Sea Shore (Property number 53). 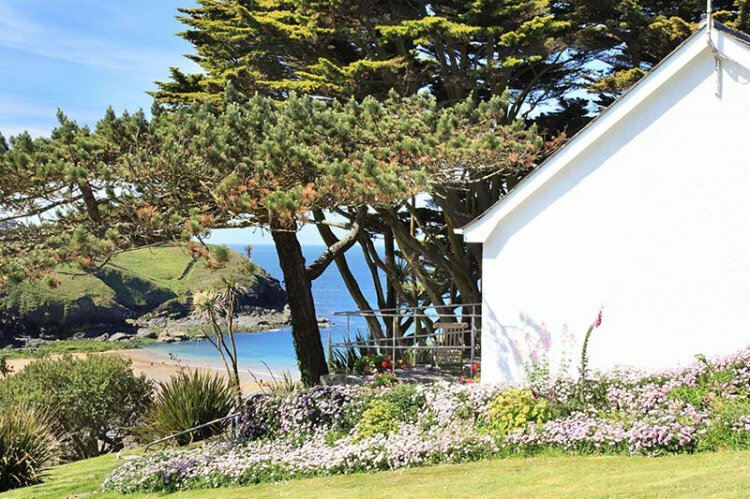 Whether you are looking for a beach holiday, a golfing break, a walking holiday or a quiet spot to rest and reflect, Trewoon offers three choices of accommodation to suit the varying needs and requirements of holiday makers. Each property is south facing and enjoys superb sea views. See Also property 52, 'The Cocolate Box' and 53 'By The Sea Shore'. Rest-a-shore is a detached, centrally heated, holiday cottage situated at the seaward side of the grounds at Trewoon and is set in its own gardens. The inside and outside of the cottage enjoys spectacular and uninterrupted views of the cove, beach and sea. The holiday cottage offers a tranquil resting spot from which you can relax and watch families of rabbits feeding in the gardens. You awake to the morning chorus of bird song and fall asleep lulled by the sound of waves breaking onto the sandy shore below. The cottage is presented with the utmost taste and care and offers luxurious accommodation for up to four people in a magical seaside setting which enjoys some of the best views in Cornwall. For those wishing to relax at home ‘Rest-a-Shore’ could hardly be bettered. The entire south facing aspect of the living area is floor to ceiling glass, from which the magnificent views of the cove and beach below can be enjoyed, together with the headland and even the valley leading to the cove. The patio at the front of the property enjoys the glorious views, perfect for your morning coffee watching the sun rise or a glass of wine as the sun goes down. Quality solid teak table, chairs and steamer chair provide your comfortable seating. From here the property is entered through the double glass doors into the open-plan living and dining area with those magnificent views from the floor to ceiling glazed frontage that can be enjoyed whether you are relaxing, dining or cooking. A high quality leather two-seater sofa and two armchairs provide comfortable seating from which to admire the view. There is a wall-mounted 40" LCD TV with Freeview and a dining area with solid oak table and chairs. From the double bedroom guests will enjoy breathtaking beach and seascape views from the comfort of their solid oak 5' king- size bed. The twin bedroom enjoys a view of the cottage's private rear garden. NB ALL PILLOWS ARE FEATHER. PLEASE NOTIFY AT TIME OF BOOKING IF MICROFIBRE ARE REQUIRED. Outside there are private gardens with lawned area, two patios with garden furniture. From here you can take the short path, down through the grounds of Trewoon to the private gate giving access to the cove and beach. Dogs: 2 adult dogs are allowed by prior arrangement at £40 per dog per week. Rest-a-Shore is part of the Trewoon family of cottages, the other cottages are displayed below.